This holiday season SEPHORA COLLECTION comes out with a whole theme of Ice Cream collection assorted items that are actually makeup. 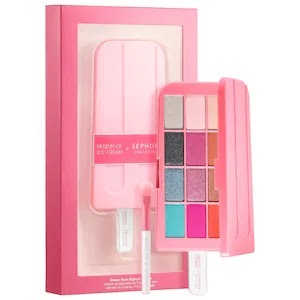 There is an eyeshadow palette, blush/highlighter palette and lip gloss popsicles. The theme is fun and cute, something SEPHORA has not done before. 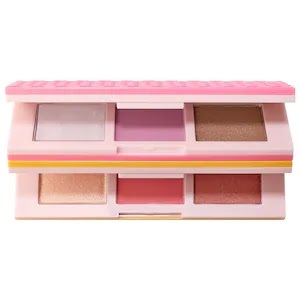 A playful limited-edition collection of makeup featuring colorful makeup and accessories inspired by ice cream. Founded in 2016, Museum of Ice Cream creates one-of-a-kind, transportive experiences aimed to ignite imaginations, build community, and foster human connections. Throughout the experience, visitors are encouraged to embrace their inner child as they interact with installations and candy-coated rooms that play to all five senses. With the same playful approach, Museum of Ice Cream and Sephora Collection have teamed up to bring you the sweetest limited-edition collaboration. This delectable collection captures the vibrant personality and signature design aesthetic of Museum of Ice Cream’s most beloved spaces. So dive right into the famous Sprinkle Pool®, unleash your inner unicorn, and join us on this sugar-filled candy journey. A limited-edition deliciously tempting face palette to bronze, highlight, and add the perfect flush to the cheeks. Add warmth to the cheeks with these six dessert-inspired shades. This full-face palette features four soft pressed powders and two illuminating cream-to-powder formulas that melt into the skin for a natural-looking finish. Treat yourself to the sweetest confectionary glow. Founded in 2016, Museum of Ice Cream creates one-of-a-kind, transportive experiences aimed to ignite imaginations, build community, and foster human connections. Throughout the experience, visitors are encouraged to embrace their inner child as they interact with installations and rooms that play to all five senses. With the same playful approach, Museum of Ice Cream and Sephora Collection have teamed up to bring you the sweetest limited-edition collaboration. This delectable collection captures the vibrant personality and signature design aesthetic of Museum of Ice Cream’s most beloved spaces. So dive right into the famous Sprinkle Pool®, unleash your inner unicorn, and join us on this sugar-filled candy journey. A set of four lightweight and colorful lip stains with a subtle glossy finish with no stickiness for a comfortable feeling. Indulge in summer’s sweetest treat with a popsicle-stained lip look. Designed with a smooth texture to glide onto lips effortlessly for an even application, these lip colors provide the ultimate look for any sunny day with a formula that combines bright color with a subtle shine. Awaken childhood memories of delicious soft serve cones and icy treats with these youthful shades. Four popsicle-inspired lip stains in Cherry on Top, Creamsicle, Purpleberry, Bubblegum Kween. Founded in 2016, Museum of Ice Cream creates one-of-a-kind, transportive experiences aimed to ignite imaginations, build community, and foster human connections. Throughout the experience, visitors are encouraged to embrace their inner child as they interact with installations and rooms that play to all five senses. With the same playful approach, Museum of Ice Cream and Sephora Collection have teamed up to bring you the sweetest limited-edition collaboration. This delectable collection captures the vibrant personality and signature design aesthetic of Museum of Ice Cream’s most beloved spaces. So dive right into the famous Sprinkle Pool®, unleash your inner unicorn, and join us on this sugar-filled candy journey. The SEPHORA COLLECTION X MUSEUM OF ICE CREAM SEPHORA COLLECTION is available at www.sephora.com and in SEPHORA stores for the holidays. Like SEPHORA on Facebook: https://www.facebook.com/Sephora?ref=br_tf; Follow SEPHORA on Twitter: @Sephora, Follow SEPHORA on Pinterest:http://www.pinterest.com/Sephora/; Follow SEPHORA on Instagram: http://instagram.com/SEPHORA; Subscribe to SEPHORA on YouTube:http://www.youtube.com/channel/UC9YX5x_VU8gfe0Oui0TaLJg; Follow on Google+: https://plus.google.com/+ Sephora/posts; Follow SEPHORA on Wanelo: http://wanelo.com/sephora and Follow SEPHORA on Tumblr: http://theglossy.sephora.com/.